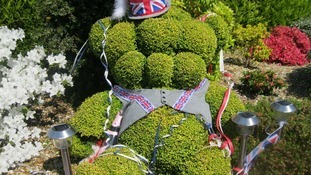 A mammoth four-day Diamond Jubilee bank holiday has kicked off. Across the North West, hundreds of street parties have been organised, as well as the lighting of Jubilee beacons. Enjoy the pictures, and send us yours! 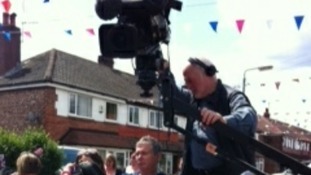 Mel Barham's report from the Noreen Avenue Street party! Paul Crone has spent the day at the Blackpool Tower ballroom where everyone was enjoying the party! We had to share this picture of Knowsley Road's longest residing neighbour with the newest addition! Beryl Atherton opened the party - she has lived on the street for 60 years. Newest resident, Harry Lea, at just 5 days old, also made a brief appearance. As last night's Jubilee Concert at Buckingham Palace was drawing to a close, thousands of beacons were being lit around the country to celebrate the Queen's 60 year reign. A network of flames criss-crossed the country, with a number of beacons lighting up the night sky here in the north west. Our correspondent Andy Bonner joined the build-up to the event. You have been sharing your photos of the Diamond Jubillee beacons being lit across the region. As the Jubilee celebrations reach their final day, we have complied a round up of your photos of street parties across the North West.